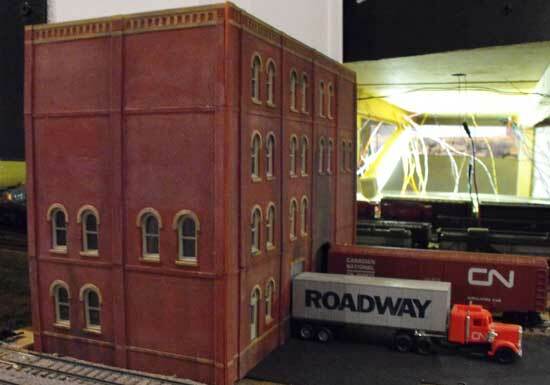 On my last Utopia Northern HO model railroad I had a supporting pillar in my basement that couldn't be moved. Hidden storage tracks and the mainline passed behind it. Two tracks going to Fort Eerie from Underhill North passed in front of it. The upper deck for North Point was above. It had always bothered me. I needed a way to disguise the pillar. 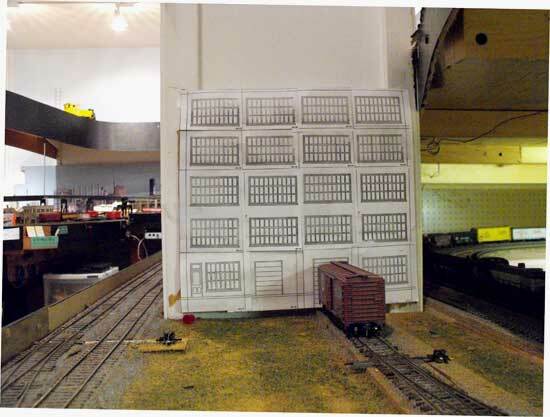 The All Stuff factory was supposed to be where the pillar is and the siding to the factory dead ended at the pillar. I decided to try disguising the pillar using building flats made with Design Preservation Models (DPM) wall parts. The DPM packages come with templates so I roughed out a possible building side by cutting apart templates, photocopying them and taping them to a piece of cardboard. Then I assembled the building flats for three wall sections to wrap around the pillar. I assembled them following DPM's instructions and painted them. I spray painted a base coat of automotive gray primer from a can. After that was dry I used my airbrush to paint the walls with a reddish brown mix of Floquil paints. The window frames were painted separately with a concrete color. I weathered everything with Hunterline Weathering Mix and added more weathering with Decor Art acrylic paints using brushes. After all the painting was done I glued the flats together with Tenax cement. I added some styrene bracing inside the corners. Then I slipped the assembled wall sections around the pillar. Here's a view of two sides of the building. The part that is out of sight had to be several stories less to clear the fascia. There was still some scenery work to be finished to plant the assembled DPM building flats and a proper street needed to be constructed. But for now there was a factory destination for freight cars and trucks. When you have obstructions like pillars or need something narrow in front of a backdrop, try kitbashing with building flats. Return from "building-flats" to kit building overview. Return from "building-flats" to my Home Page.